Woodmizer claims to be the “world leader in the portable sawmill industry.” Despite the truth of this claim, there is no doubt that Woodmizer is one of the world's top manufacturers. In the United States, they have become the go-to company when a sawyer is looking for a reliable, portable sawmill. Their products are geared toward hobbyists and professionals and come in a variety of sizes and price points. Most Woodmizer sawmills feature what they call a “cantilever design” on a monorail system. What this means is that the sawmill head travels down a single track and is mounted to a single post. One misconception is that this creates an inaccurate cut. 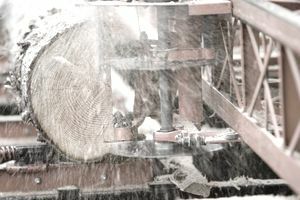 Some think that having the saw head mounted to a single post translates into less support, which causes head to flex, resulting in a tapered cut. However, that is an inaccurate assumption. Woodmizer has overcome flexing with a monorail system that supports the saw head on the top and bottom of the single rail track. This feature is truly a technologically innovative design. With only one post to workaround, you can saw logs that are larger than you would expect to be able to cut. You don't have to squeeze the log between 2 or more posts. This gives you the ability to whittle the log down to a more manageable size right on the mill. An odd-shaped log can also be sliced more easily on this cantilever design. Another advantage of this unique Woodmizer design is that you can cut logs accurately on an uneven surface. While it is always a good idea to get your sawmill as level as possible, the monorail design gives you more flexibility since the saw head is always parallel to the track. Having too many automated saw-milling processes may make you more detached from the process. You may find yourself daydreaming about that next piece of timber because the computer is thinking for you. Your mind can wander, and you may forget what you're doing. Any form of inattentiveness is dangerous when operating a sawmill. You need to be well aware of everything that is going on so you can work safely. Certain features of the manual Woodmizer sawmills don't make much sense. The crank feed system on the LT 15 and LT 28 sawmills is an unnecessary feature. It would be easier to push the saw head through the cut rather than turn a crank that pulls the saw head through. Turning this crank puts stress on the operator's shoulder, increasing fatigue. Where did the “Cantilever” and “Monorail” System go? Two of the best features on most Woodmizer sawmills are not featured on the smaller LT10 and LT 15 model sawmills. These models run on a dual track and have two posts that support the saw head. Woodmizer sawmills are at the higher-end of the scale when it comes to price. Although this may seem like a distinct disadvantage, it is reflective of Woodmizer's value. All of the technologically advanced features that set Woodmizer apart cost money to produce. These sawmills have been designed to produce the most accurate lumber in the most efficient way. For a true production sawmill, Woodmizer stands out as a leader in the industry.